The Tyne Is All Mine! The latest round of the 2018 Angling Trust Riverfest qualifier campaign took place on the River Tyne. Despite blazing sunshine and high water temperatures, the match fished well producing six (6) double-figure weights from the forty (40) strong field. 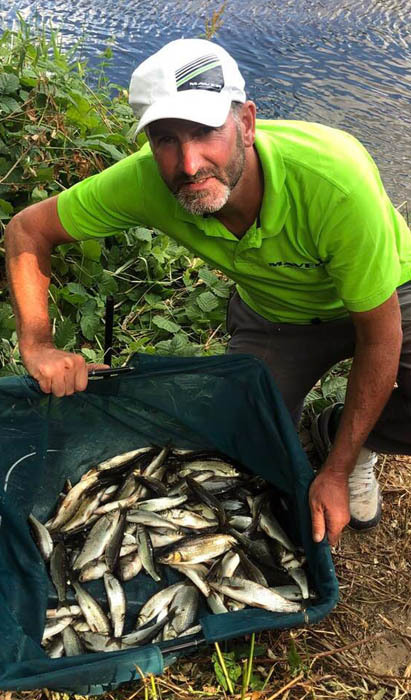 Winner on the day with 19-01-00 was Northern match ace, Eddie Bridon, who produced an awesome display of pole fishing to catch one hundred and eighty (180) dace and small chub from peg 21 on Bywell Road. Fishing at 13 metres, Eddie tackled his 3ft deep swim with just two rigs feeding six (6) balls of groundbait laced with loose feed to kick start his peg to then caught throughout the match on maggot hookbait. Below, Eddie reflects on his qualification for this year’s final. Eddie books his place in the 2018 Riverfest final with 180 dace for a little over 19lbs. “With the river level being so low, I didn’t really fancy my chances of qualifying from this area. After a bit of a think, I decided for an all out pole attack long at 13m“. “I decided to keep things nice and simple and set-up my trusty Signature 800 for use with just two top four rigs. The first of which revolved around a 0.3g MV-R finesse series 2 set at full depth (3ft). The second rig used a 0.2g MV-R finesse series 2 set at half depth at around 18 inches. For both rig, I used 0.12mm MV-R rig mono tied to 0.10mm MV-R hooklength mono. To finish, both set-ups used a size 16 Katana 1045 hook“. “I started the match by introducing six (6) large balls of groundbait laced with casters, dead maggots and hemp with the intention of loose feeding casters and maggots over the top throughout the match“. “For the first hour of the match, I enjoyed some great sport putting sixty (60) dace in the net followed by a further thirty during the second hour. At this stage of the match, I had a ring around to find out what was happening elsewhere and, to my surprise, the favoured areas were not fishing too well so all was to play for“! “I had a bad middle hour with only ten (10) fish coming to the net before the weather changed a little with some cloud cover and a bit ripple seeing my catch rate pick up again“. “At the end of the match I had one hundred and eighty (180) dace for 19-08-00, which not only won my zone, but won my zone and the match overall“.